For some of us, the New Year has already arrived, while others are still in anticipation of the New Year holiday miracles. Changelly team is happy to congratulate our users on the upcoming Chinese New Year! On the eve of the holiday, we have prepared a crypto horoscope for you. 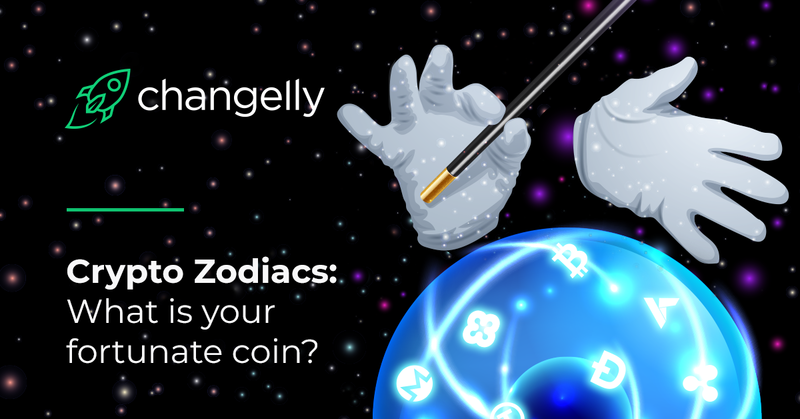 So match your zodiac with our crypto signs and choose your fortunate crypto of the new 2019! The year 2019 in China will take place under the sign of the Golden Pig. In Chinese culture, these smart animals represent the symbol of wealth and fortune. So does the first zodiac in our crypto horoscope, which was born 12 years ago under the Pig lucky sign. Capricorn is very practical and prudent in regard to money. That is why Capricorn will never throw money into the wind, lend without a firm commitment, or make rash spending. This cryptocurrency needs no introduction. Bitcoin is considered to be the progenitor of the crypto universe. The asset was born under the constellation of Crypto-Capricorn in the year of the Pig. The work on BTC started in 2007 according to Satoshi Nakamoto claims. It is the first cryptocurrency issued without state control (fully decentralized). Thanks to Bitcoin, people all over the world can transfer money bypassing centralized institutions such as banks and remain confident that there will be no personal data fraud. It has long been clear to all that financial structures have become outdated and the emergence of Bitcoin-Crypto-Capricorn has become both a global answer and a question for solving super-tasks for human needs. During the developing era of blockchain technologies, Bitcoin settled and occupied its niche in the financial world. Today this brightest crypto representative keeps the developing course along the set trajectory. Aquarius is quite calm about money and will never shake over his money. Although you cannot call Aquarius a spender either. Decred — Aquarius, born in the year of the Monkey. This currency is unique and reliable as a well-known Bitcoin programmers team have been working on it. Their goal was to create a more advanced descendant of Bitcoin, taking into account all the disadvantages of its predecessor. The unique features of the project idea is undoubtedly a characteristic feature of Aquarius, which makes the project stand out from the crowd. Money for Pisces is not a goal, but only a means. That is why Pisces are rather indifferent to money, and if they get rich, their compassion finds expression in Charity. Qtum is a somewhat contradictory combination of a calm and dreamy Pisces, with a restless and fearless Rooster, whose life resembles a roller coaster. This is certainly a promising project, combining the principles of Bitcoin and Ethereum. Honesty, excellent natural intuition, peculiar to Fishes, is expressed already in the fact that famous companies are partners and investors of the project. Aries are cool about money. For Aries the income is only a means to help them achieve their goals. However, Aries are not only hard-workers but also good money-makers. NEM, or as it is also called, “Japanese ethereum” is a very ambitious project. Without a doubt, this is a bright Aries, born in the year of the Goat. According to crypto astrologers rightfully has every chance to be considered one of the most promising players in the cryptocurrency market. This is clearly indicated by the open source public code on which the project was developed. NEM is characterized by high performance, the system of participants’ reputation, fast and cheap transactions, orientation to the traditional financial sector of the economy. Taurus is a very monetary and purposeful zodiac sign. Welfare and property are at the first place for this zodiac sign. Originally, Aion was the ERC-20 token, developed on the Ethereum blockchain. The Aion Kilimanjaro mainnet release along with the launch of Aion mainnet coin happened on April 25th, 2018. Since then, The Aion coin has become the native asset of the Aion blockchain which is utilized for critical network functionality and its crypto-economic mechanisms namely: peer-to-peer transactions, utilization of computational resources, rewarding network operators and ultimately a critical security mechanism for inter-chain bridging and our consensus roadmap. Gemini attitude to money depends on their changeable mood. The income itself is not an end in itself for them, but it gives them a sense of freedom. NEO is a Crypto-Gemini born in the Year of the Rooster. It is believed that NEO is the Chinese equivalent of Ethereum, which is the first non-commercial blockchain project in its region. The project uses smart contracts, which allow you to process information quickly and, it is worth noting, a lot of resources are devoted to organizing system security. NEO undoubtedly inspires confidence and respect with its long-running plans and the order of their implementation. The seriousness of the project is given by the fact that this decentralized system cooperates with government agencies and today has attracted large global investors. Cancer is very thrifty and therefore a very monetary zodiac sign. At the same time, remain confident that Cancer always chooses the most reliable way of funds storage, and is not afraid of any crypto-winter! Ethereum is a crypto Cancer born in the year of the Goat. Silver in the crypto-world, which became the second most popular after Bitcoin, led by the famous Vitalik Buterin. It is the first platform for creating decentralized blockchain-based online services, which made it possible to conclude “smart contracts” of any complexity and to track compliance with the terms of the transaction. In essence, it is a single decentralized virtual machine. Stratis — Crypto Cancer, born in the year of the Monkey. It is a powerful platform based on blockchain technology. It is a business-oriented project whose goal is to develop, implement and test the needs of financial companies that want to move to a decentralized system. At the same time, Stratis is a well-functioning consulting agency. Binance token is a classic Cancer born in the Year of the Rooster. The asset is based on Ethereum blockchain, referring to the Hong Kong cryptocurrency exchange — Binance. Such projects as Binance token, are becoming in demand by the market, thanks to the rapidly growing turnover of cryptocurrency trade. EOS is yet another Cancer, born in the year of the Rooster. As a representative of his element EOS has a very bright personality. In the cryptocurrency market, its mission is to simultaneously solve many problems and ensure the highest speed of transactions. The very speed of performing tasks, compared to the Bitcoin network, is several million times higher and at the same time excludes any fee for a commission! Lion is a maximalist and frequently goes overboard when it comes to money spending. In other words, Lion likes to live in a big way. The date of birth of the Bitcoin Cash is August 1, 2017. Like the real Leo, the project turned out to be the largest regarding capitalization in 2017. In fact, Bitcoin Cash is a project separated from the basic version of Bitcoin currency. Leo has an inherent strength and tremendous ambition. They strive to achieve the highest peaks! In BCH case, the recording of all network data is much more advanced than for classical Bitcoin (BTC) — in simple terms, it takes less time for BCH to confirm a transaction than for BTC. Virgos are extremely thrifty in regards to money. Even if a huge inheritance falls on them, they will continue to save, considering every step they take. Ripple is the Virgo born in the year of the Dragon. It is a centralized system of money transfers and currency transactions, which provides instant, secure payments and global financial transactions with a minimum commission. Born under this sign, Ripple perfectly complies with existing laws. This is the reason why the world’s largest financial institutions such as UBS, UniCredit, ATB Financial and many others are among those to adopt Ripple to improve their cross-border payments. Libras tend to have a fairly reasonable attitude to money: they prefer to buy quality goods at an affordable price. Litecoin is by definition considered to be silver in the crypto world. It is a peer-to-peer online currency, with almost zero in value, payments anywhere in the world. This representative of Libra is open-source and is a global, fully decentralized payment network with mathematical protection. Much quicker transaction confirmations characterize this cryptocurrency. Serious industry support, impressive trading, and liquidity make Litecoin currency a serious, popular and reliable commercial tool. using the proven features of the solid, reliable Nxt blockchain technology. Scorpio is a winner by nature, able to achieve his own. If Scorpio sets a goal to get rich, he will definitely achieve it. Tether is a Scorpio, born in the year of the Goat. It is a project where each Tether coin (USDT) is pegged to the US dollar and is used as a bargaining currency within exchanges. Since Tether was developed on the basis of the Bitcoin blockchain, the developers managed to combine the positive aspects of cryptocurrency and fiat money, which distinguishes this currency from its counterparts. Bitcoin Gold is a Scorpio, born in the Year of the Rooster. This coin is positioned among “Bitcoin family” as one of the most decentralized cryptocurrencies. The new Bitcoin Gold algorithm is considered one of the main aspects that distinguish this cryptocurrency from its closest relatives. ARK is a Scorpio, born in the year of the Monkey. The main task of the project is to become a link or a bridge for all separate blockchain projects while reducing their gap in the chain of the network and make blockchain technologies more accessible to people in everyday use. Innovative ideas distinguish Ark from other representatives of the Scorpio sign. Even earning decent money, Sagittarius can live from paycheck to paycheck. In dealing with finances, Sagittarius can be extremely careless, and their generosity and compassion sometimes know no boundaries. However, if Sagittarius find the right crypto-match, there are much more chances to get very wealthy. Dogecoin — Sagittarius, born in the Year of the Snake. This coin was one of the first to appear on the crypto market. The story of appearance, conceived by developers as a joke, eventually grew into a project that proved to be a fast decentralized coin with a friendly community and is used mainly for charitable gatherings. Significant investments in advertising, affordability, an unusual emblem in the form of a Japanese dog breed Shiba Inu make the Sagittarius Dogecoin jovial and very popular.